Doyle Sail makers are one of the world’s largest sail makers, with over 80 locations around the world. The Southampton Loft covers every aspect of sail making & service from Dinghies to Superyachts, which is something no other Loft in the UK can boast to do. Doyle Sails were based in a unit in Shamrock Quay, Southampton & had run out of space. An opportunity to take a unit at Universal Marina in Sarisbury Green, Southampton was taken that would allow the business to grow & operate more efficiently with all manufacturing at ground floor level. 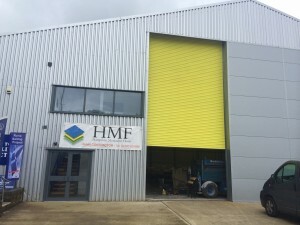 Doyle Sails asked HMF to design a mezzanine loft sail floor just 1200mm high throughout most of the new unit to enable the manufacture of all sizes of sails. Doyle Sails required cut outs within the mezzanine floor to allow sewing stations to be located to enable the sails to be manufactured efficiently. 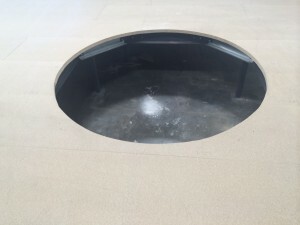 HMF provided both rectangular & circular cut outs to the mezzanine floor. The circular cut outs were to enable rotating sewing stations to be accommodated so the operators could ergonomically rotate & work on different angles easily. The loft sail was accessed by 4 sets of steel durbar plate staircases with hi-vis nosings & hand & knee rail. 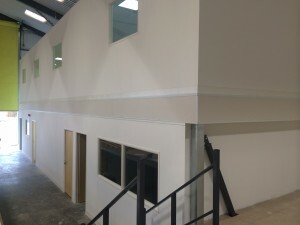 A 2 tier office accommodation was also designed by HMF to accommodate welfare facilities on the ground floor including toilets, kitchen/rest room & an office with an open plan office on the first floor. As Main Contractor HMF provided all the partitioning, drylining & suspended ceilings as well as the mechanical & electrical installations. Energy efficient air conditioning was provided to the open plan office allowing economical heating of the offices in the winter as well as cooling during the warmer summer months. The electrical installation included new energy efficient LED flat panel modular lighting, emergency lighting & fire alarm systems. HMF also installed the power & data with appropriate containment. The flooring fitted in the offices was a heavy duty contract grade carpet tile. 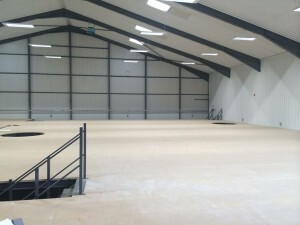 The £100K project was built on time & within budget.